If you’re on a mission to find the perfect plant to grow in your home or garden, chances are you’ll find it in the succulent section of your favorite plant nursery. It would be hard to fine one. But it won’t be hard to find a succulent you’ll love, no matter where you live. You’ll only have about 20,000 choices. This very large plant group includes varieties that range from hardy types that will survive winter freezes to tropical ones that work well outdoors in warm climates and can be overwintered in pots indoors in regions where the temperature begins to plummet in the fall. There are kinds that do well in full sun and others that prefer shade. In other words, there are succulents for all types of growing conditions. While such diversity in so large a plant group sounds great, you might be wondering exactly what to look for when you go to the nursery. That’s not as simple as it might sound. Botanists don’t agree on the definition of a succulent. One thing they do agree on is that succulents are much more than cactus. Perhaps that’s why succulent growers are fond of this saying: All cactus are succulents but not all succulents are cactus. To keep it simple, perhaps the best way to think of succulents is to think of them as plants that store water in their tissues. Hardy comes with an asterisk of sorts — be sure to choose succulents for the landscape based on their hardiness for your USDA zone. There are several ways to determine which ones will make it through the winter where you live. One way is to visit your local nursery or the plant section of a box store and ask the people working there. They can advise you about which of the succulents can go in the landscape and which should be grown in pots. They can also tell you the lowest temperatures the varieties can tolerate. Once you’ve got your plants home, if you’re going to plant them in the garden, you need to do it right. By “right,” it means to create a succulent garden or add them to your garden using the same principles as an English garden. 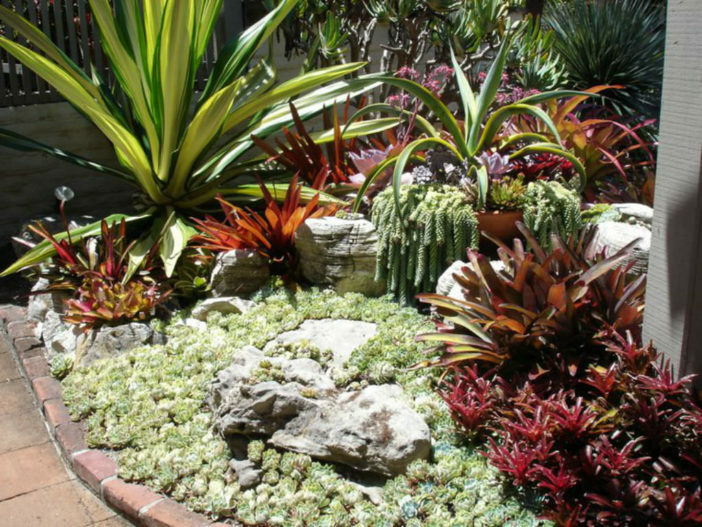 A way to achieve a natural-looking succulent garden is to create a rockery. Rockeries — sections of the garden landscaped with rocks of various sizes — are especially effective on slopes or terraced areas where they help that area become a focal point in the landscape. 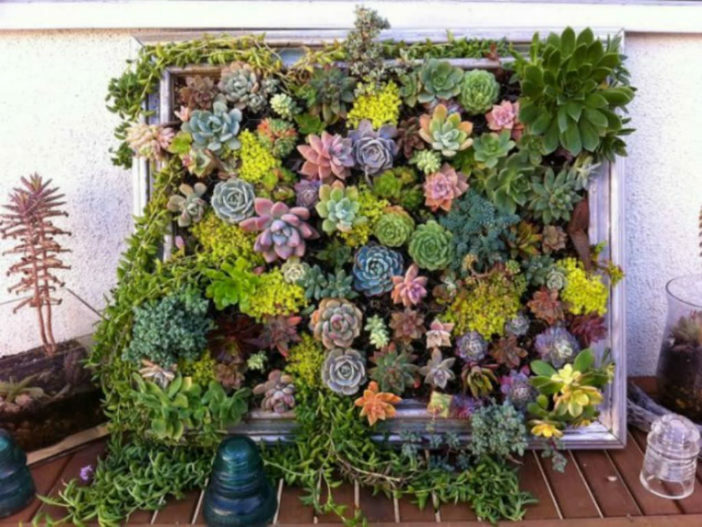 In the case of succulents, this also mimics many of their native habitats. Creating an English garden look simply means to plant succulents in groups or plant communities so they have a natural look in the landscape. Don’t put one here and one there. Another mistake home gardeners often make is planting in rows, which leads to a boring look in the landscape. Because virtually all succulents prefer well-draining soils, it’s a good idea to mix sand and gravel into native soils if you don’t have well-draining soil in your garden. Some can go for days and weeks without water, but some prefer more regular moisture. But, despite their moisture preferences, none like standing water against their crowns or for soil to stay too wet for very long. That’s where the well-draining soil comes into play. You can water normally, even onto the crowns, and the proper soil for succulents will wick the water away. A good pot-soil combination for growing succulents in containers is to choose a porous terra cotta pot and a soil mix that will drain quickly. A general mix that works well for many succulents is one that combines one part of organic matter with one part of sand or a gritty medium. Perhaps the biggest danger in growing succulents, especially in pots, is loving them too much — gardening code words for overwatering. 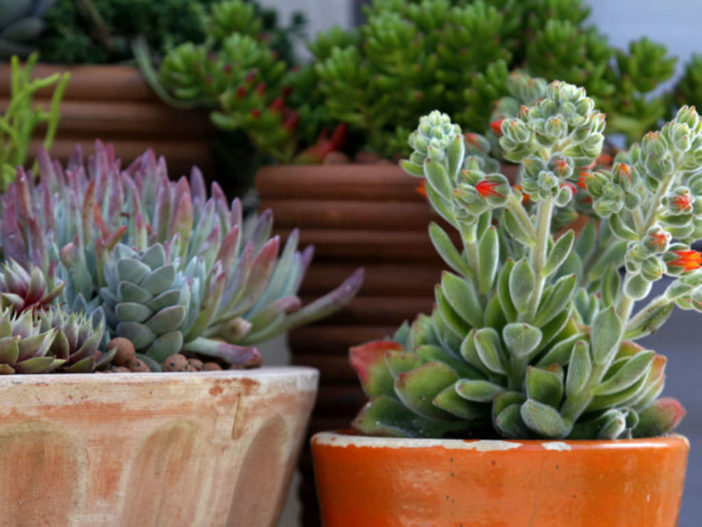 Both indoors and outdoors, succulents actually require little care and water. At most, folks might want to prune them back or take cuttings to propagate. Succulents are also ideal for pots and over wintering indoors because they can easily adapt to the dry humidity and lower light found in most homes. Succulents are generally pest resistant. When there are problems, the main outdoor pests tend to be scale and aphids with inside pests usually being fungus gnats, mealybugs, woolly aphids and, maybe, spider mites, she explained. Neem oil or horticultural oil work well in controlling unwanted visitors in both situations.